sightings and related events for whatever intelligence could be obtained. But in reality it was the CIA that had wrestled control away from the USAF by proving to the National Security Council (NSC) that the Air Force had completely bungled the job and was incapable of handling it without covering itself in proverbial eggs. Dr. Condon had worked on the ultra-secret Manhattan Project during WW II, helping develop the Atomic Bomb. Later he became the head of the National Bureau of Standards, which assisted in American scientific, technical development. But in early 1951 he suddenly left the Bureau to become the director of research and development at Corning Cookware in upstate New York. But unlike the previous director, Condon did not specialize in developing pots and pans at Corning; but instead he spent his time developing missile and rocket nose cones and heat shields/ablation shields for America's space program -- Condon had been and was a key member of the National Aeronautics Advisory Committee (NACA), the forerunner of NASA. In fact, Condon is reputed (within supersecret circles) to have based his heat shield developments on the analysis of recovered extraterrestrial material*, after he left the National Bureau of Standards at the behest of President Truman. In reality, Condon was chosen to head the UFO study in order to get the Air Force off the hook, the USAF being in the position whereby it had to pretend it was studying UFOs, while behind the scenes and in secret the CIA was conducting the real study. In point of fact, the CIA would utilize the Condon Committee to collect UFO intell, while at the same time promising the USAF it would ultimately debunk and dismiss UFOs, which was done in what became known as "The Condon Report." In February 1967, Condon and four other scientists associated with his study secretly met with CIA officials at the National Photographic Interpretation Center (NPIC) in downtown Washington, D.C., where U-2, SR-71, and satellite spy photos were analyzed utilizing state-of-the-art computer enhancement techniques. After being briefed and given a dog-and-pony show by NPIC's founder and director, Art Lundahl, who implored Condon's group to obtain some good UFO photos/films for NPIC to study, Condon issued a nationwide appeal through the media for citizens to send the Condon Committee UFO photos/films to assist the purported "impartial" study of UFOs, post-haste. In reality, the photographic evidence was being sought for the CIA to further its secret study of UFOs, on-going since the early 1950s but without a mandate until late 1957. In April 1967, a Condon Committee researcher, Dr. Gerald Rothberg of Stevens Institute, Hoboken, N.J., was dispatched to Harrisburg, Penn., to investigate an on-going local UFO flap. Accompanying Rothberg, disguised as research assistants, were two covert CIA officers, one of whom was Fred Durant, a highly experienced and knowledgeable CIA Office of Scientific Intelligence officer who typically operated under a cover of being a civilian scientist, lastly with Avco-Everett Research Lab, where he was reputed to be conducting R&D with recovered E.T. material*. Durant and his partner brought with them a van load of high-tech detection equipment such as frequency scanners, plus advanced photographic gear. The CIA men mounted a special "all-sky" tracking camera atop Harrisburg's largest hospital, interviewed local civilian UFO witnesses, and met with the Harrisburg chapter of NICAP, then the nation's largest and most influential civilian UFO group, headed by an anti-UFO secrecy activist, Maj. (Ret) USMC, Donald Keyhoe. Condon's most valuable service to the CIA, however, began in 1968 when another Condon Committee press release invited Soviet Union scientists to participate in his purported "independent scientific study" of UFOs. Condon was just dangling bait for the CIA, trying to get Soviet officials into a "non-aggression" treaty on UFOs. Subsequently, Condon "researchers" -- some of whom were covert CIA officers -- met with Soviet Bloc scientists in Eastern Europe, where the treaty parlay was set in motion. Interestingly, Admiral Roscoe Hillenkoetter, the CIA's first director in 1947, was very vociferous about the dangers of accidental nuclear war triggered by UFO intrusions and overflights, either in the Soviet Union or America -- to the point he allowed NICAP Director Don Keyhoe to publicly quote him warning as such while he served on Keyhoe's NICAP Board of Governors. It's not known if the Admiral ever learned of the ultra-secret "non-aggression" pact between the Russians and Americans, signed in 1969, but he must have breathed a sigh of relief if he did. In the end, the Condon Report, released in late 1969, was a classic example of CIA disinformation, for it not only dismissed UFOs but also called for the USAF to cease investigating them, no matter how concerned about UFO intrusions witnesses might be. Thereafter, UFO intelligence became a matter for the CIA to secretly collect and analyze, even though in the fall of 1975 UFOs were buzzing USAF SAC B-52 bases and missile sites, hovering over and, in the Air Force's own words, "demonstrating a clear intent toward nuclear weapons." But Fred Durant, author of the CIA's Robertson Panel Report in 1953, perceived the greatest danger of UFO activity was the public and news media attention given to them. Durant had outlined a program of debunking and downplaying UFOs in order to prevent what he called "a morbid national psychology," which might foster "a harmful distrust of duly constituted authority." The Condon Report sealed the lid on the coffin in which the truth about UFOs was buried. However, the UFO or flying saucer misinformation war between the U. S. and the USSR had been on--going since about 1950. The Soviets had suspected from the early days of saucer sightings in America that it was all a misinformation game designed to scare them into believing the U. S. had developed some sort of fantastic secret aerial weapon (which the USAF tried to reinforce by loudly proclaiming it was developing the AVRO disc** in the early 1950s). Conversely, in America some top scientific advisors to the Air Force [demurred] -- such as Dr. Anthony Mirarchi at the Air Force Geophysics Lab in Cambridge, Mass., which was receiving films of UFOs shot at White Sands Missile Range, N.M., shot by telescopic tracking cameras; Mararchi knew the UFOs surveilling White Sands were real but was convinced they were an amazing technological advancement by the Soviets. The Soviets had gone so far as to stage an "accidental" exposure of a supposedly "Top Secret" schematic of a (bogus) Soviet-built flying saucer to an American spy in Moscow in 1950. Then in 1953 the Russians tried to reinforce this misinformation by planting a story in a Vienna, Austria, newspaper which claimed a flying saucer had crashed on Norway's Spitzbergen Island, and it had Russian markings on internal parts and matched almost exactly the bogus schematic exposed to an American spy in Moscow in 1950. After Condon had buried the truth about UFOs with the study he headed and the report it generated, all designed to get the Air force off the hook and take UFO research underground where the CIA would answer to no-one, the public was only partly persuaded; but academia and politicians swallowed it like the proverbial hook, line, and sinker. Now, however, all manner of nonsense became part of the public forum on UFOs; but still, in spite of Fred Durant's gloomy predictions, America did not fall apart, the Soviet Union did. The CIA's motto, borrowed from the Bible, says: "Know ye the truth, and the truth shall set ye free." Sadly, America has yet to be set free by learning the truth about UFOs being withheld by the CIA and other U. S. government agencies. 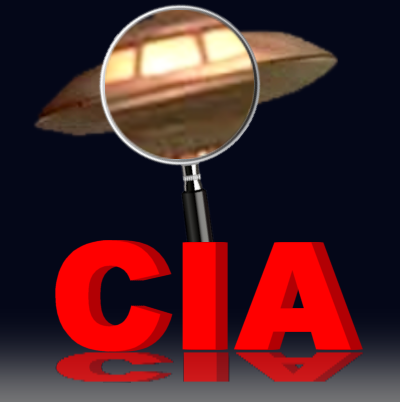 UFO / ET Contact at CIA Head Quarters in Washington D.C.?